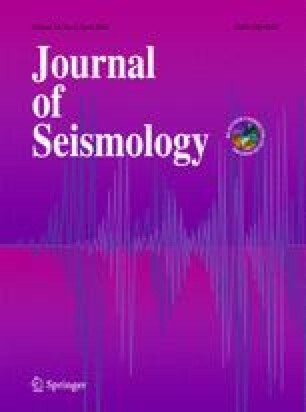 A method is presented for deriving 1-D velocity depth models from earthquake bulletin data. The models can be used as initial models for more advanced modelling techniques such as tomographic inversion. The method is useful when there is little or no refraction and long-range reflection survey data. The bulletin travel times are subjected to an analysis of variance, where they are separated into source, distance, and receiving station terms. The distance terms describe the variation of travel time with distance, and the associated trend lines allow 1-D velocity models for the crustal layers to be determined. The velocity models provide an average crustal model for the region derived from local data. This does not include superficial layers which are necessarily poorly determined. Earthquake bulletin P-wave data from propagation paths across three different regions of the UK are employed to illustrate the use of the technique.